I always liked my safe comfort zone. It was small, safe and it left little room for me to make mistakes and potentially embarrass myself, or do anything that could draw attention to me. It wasn’t always like this; at primary school I was happy confident and outgoing. I was bullied all throughout my primary school days but I never felt the effect of it until I reached secondary school. When I got to secondary school it felt like everything I knew was wrong. I was never the most academic student but self-doubt took over and seemed to take my confidence with it. I didn’t know how to ‘fit in’ and make friends, throughout school, I drifted between social groups but never felt like I was actually a part of them. I often found there would be one person I could get on with and I felt like a spare part that was there for the sake of it, just because one person wanted me there. I thought college would be better; new start, new people, no one knew me. The subjects would be of my choice. I’d be happy. Once more, I chose to stay inside my ‘safety bubble’ instead of talking to people and taking the opportunity to have a real college experience. My friends would tell me all the amazing memories they had and I seemed to have none. I hated playing safe. It was taking over my life, spoiling everything for me. So I decided university was going to be my time to go out, make friends and make memories. For the first two years, the same cycle happened, except this time I was completely alone. Come third year I had finally decided that enough was enough. What am I going to get out of playing it safe? Making no memories? Nothing. I’d get nothing. Third year came and I did it… I spoke to my classmates and I sat with them at lunch. It wasn’t scary and I’ve met some of the most amazing people and made some great memories. I always loved being active but never did anything in case I embarrassed myself, failed or people laughed at me. I’d heard about these aerial hoop classes and had seen photos online; I so badly wanted to do it but I had put it off for months. Eventually, I found the courage to take the plunge and I haven’t looked back since. It’s one of the best choices I’ve ever made. No one cared if I didn’t do it; they cared that I’d tried and had fun. Since then I’ve started taking other classes and I’ve never felt more confident. Sure, I still get nervous and don’t always know what to say, but I’m putting myself out there and making myself feel vulnerable in the best possible way and I wouldn’t change it for the world. I no longer want to lead a ‘safe’ life and settle for comfortable. It’s taking time but I’m loving my journey and my new memories. Annika is a psychology graduate and experienced bullying throughout her childhood which impacted on her confidence and self-worth. For many years, Annika chose to avoid being seen, living in a small, safe comfort zone with little room for making the mistakes that help us grow. 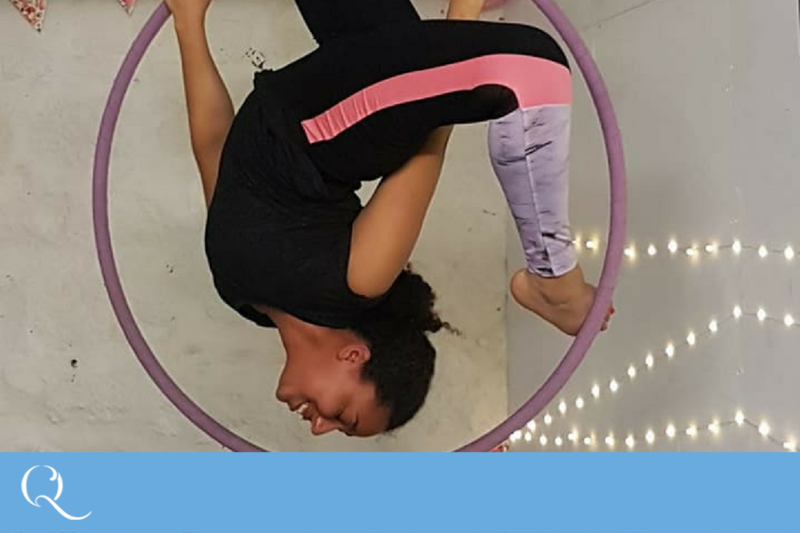 Annika has now found the courage to stretch beyond her comfort zone and trying new things has helped her confidence grow.